Given the controversial content of this post, I’d like to remind readers upfront that this post, like all of the contents of this blog, represents my personal opinions, and in particular does not represent the opinions of my present or former employers. I am not a lawyer, nor do I claim to have read any of the patents to which I directly or indirectly allude in this posts. None of the below should construed as legal advice. Finally, the material is US-centric — your national software patent policy may vary. My feelings about software patents are a matter of public record (e.g., this open letter to the USPTO). As things stand today, software patents act as an innovation tax rather than as a catalyst for innovation. It may be possible to resolve the problems of software patents through aggressive reform, but it would be better to abolish software patents than to maintain the status quo. My personal feelings notwithstanding, I acknowledge the reality that today’s software companies need to have defensive patent strategies. In a previous job, one of my key accomplishments was to hire a director of intellectual property. It was a difficult hire, but it happened just in time to defend against a particularly noxious patent troll. I am not at liberty to spell out the details, but I can say that we responded with a long, expensive fight that effectively quashed the patent and the lawsuit. Patent trolls, known less pejoratively as non-practicing entities (NPE) because they do not actually sell products or services that implement the systems or methods in the patents they own, take advantage of asymmetric risk. On one hand, an NPE does not need much money to bankroll (or at least initiate) a patent infringement suit — in fact, there are law firms who will take such cases on contingency. On the other hand, the company being sued faces potentially ruinous costs. Moreover, even if a company feels certain that a lawsuit against it is baseless, the company cannot count on the imperfect and inefficient legal system to reach a fair outcome. As a result, the company has to choose between spending heavily in its own defense or settling with the NPE. Most companies opt for the less risky route and negotiate settlements, providing funds that the NPEs use to sue more companies. Yet in practice, democratic governments often negotiate with terrorists. There have been various attempts to address the threat of patent trolls. Google litigation director Catherine Lacavera has gone on record saying that Google intends to fight rather than settle patent infringement lawsuits in order to deter patent trolls. We’ll see if Google can sustain this “we don’t negotiate with terrorists” approach; I admire the resolve, but like Neumann I’m skeptical. Article One Partners has built a business around crowd-sourcing patent invalidation. Clients pay for research to invalidate patents, and Article One offers bounties to anyone who contributes valuable evidence. In theory, companies can request validity analysis of their own patents to test them for robustness, but I assume that the primary application of this service is the invalidation patents that a company sees as threats. Rational Patent (RPX) has created a defensive patent pool. purchasing a large portfolio of patents and then licensing them to its member companies. Some have questioned whether this approach is “patent extortion by another name“, and indeed paying RPX for a blanket license does feel a bit like preemptively settling in bulk. But I’d be more concerned that the “over 1,500 US and international patent assets” that RPX claims to have acquired are a drop in the bucket compared to the vast number of patents that the USPTO has granted, many of dubious merit. Meanwhile, patent trolldom is serious business. Former Microsoft CTO Nathan Myhrvold created Intellectual Ventures to “invest both expertise and capital in the development and monetization of inventions and patent portfolios.” The company has only filed one lawsuit so far, but Mike Masnick claims that it has used over a thousand shell companies to conduct stealth lawsuits. Unfortunately, the proliferation of lawsuits by software patent trolls suggests that the economic incentives encourage such suits. If every company could sustain a “Never give up, never surrender!” approach, patent trolls would eventually go away, but it is unlikely that companies would be willing to assume the short-term risks that such an approach entails. Moreover, this approach only works if everyone participates, requiring that every company forgo the competitive advantage it could enjoy from being the only company among its competitors to appease the trolls. This is a classic tragedy of the commons. I’m hopeful that we’ll eventually implement sensible patent reform in the United States, but I expect it will take a long time to overcome the entrenched interests that support the status quo. But NPEs are not the only cause for concern. Many established companies, including some technology leaders, are not averse to using patent lawsuits as part of their business strategy. The mobile device and software space is a particularly popular arena for patent litigation, the most notable being Oracle’s lawsuit against Google claiming that Android infringes on patents related to Java. The stakes are extraordinary, dwarfing even the $612.5M that RIM paid NTP in order to avoid a complete shutdown of the BlackBerry service (ironically, at least some of the patents involved have since been rejected by the patent office after re-examination). Patent lawsuits can also be a way for larger companies to bully smaller ones. For example, a couple of entrepreneurs at visual search startup Modista were forced to shut down their company because of a lawsuit by Like.com, a more established player in the space which was ultimately acquired by Google. Note: although I was Google at the time, I have no inside knowledge of the acquisition, nor whether there is any truth to the speculation that Google acquired the company for its patents. Moral considerations aside, the above stories make it clear that defensive patent strategy isn’t just about NPEs. In fact, many software companies take an approach to defensive patenting is to assemble a trove of patents that are useful for countersuits and thus serve as a deterrent. Back to military metaphors, it’s similar to countries developing nuclear weapons (a popular metaphor for patents in general) in accordance with the doctrine of mutual assured destruction. Companies that follow a defensive patent strategy typically implement a process for capturing intellectual property. Scientists and engineers file invention disclosures, a committee reviews these for patentability, and a law firm translates the invention disclosures into patent filings. The filings then go through the meat grinder of patent prosecution and eventually are extruded as patents. It all sounds great in theory — indeed, I have seen executives who mostly worry about educating scientists and engineers about patents and providing the right incentives to encourage them to write and submit invention disclosures. Indeed, it can be difficult to integrate intellectual property capture into the process and culture of a software company. But I think there are two much bigger issues. First, it takes several years to obtain a patent. Indeed, the USPTO dashboard shows that it takes two years just to get an initial response from the patent office. Thus a defensive patenting strategy requires significant advance planning: any patents filed today are unlikely to be useful deterrents until at least 2014. Given the rapid pace of the software industry, this delay is very significant. Moreover, startups are especially vulnerable in their first few years. Second, intellectual property capture processes are inherently optimized for offensive (i.e., don’t copy my invention or I’ll sue you) rather than defensive (i.e., don’t sue me) patent strategy. Consider Google’s defensive position with respect to Oracle in the aforementioned lawsuit. Google has a relatively small patent portfolio, but it has obtained patents for some of its major innovations, such as MapReduce. Let’s put aside questions about the validity of the MapReduce patent — especially since patents enjoy the presumption of validity. The bigger question is to whom such a patent serves as a deterrent against patent lawsuits. It may very well deter Hadoop users, which include Google arch-rival Facebook. But, as far as I know, Oracle is not vulnerable on this front. FOSS Patents blogger Florian Mueller did an analysis and concluded that Google’s patents are not an effective deterrent. Indeed, the fact that Google has not counter-sued Oracle using its own patents is at least consistent with this analysis. What if Google were to invest in obtaining (i.e., purchasing) a collection of broad patents that had to do with relational databases? Such patents could have nothing to do with Google’s areas of innovation and nonetheless serve as an effective deterrent against lawsuits from relational database companies like Oracle. Even if the patents were not robust, they would still have some value as deterrents because of their presumption of validity and the aforementioned inefficiency of the legal system. In general, the most valuable defensive patents are those that you believe your competitors (or anyone else who might have an interest in suing you) are already infringing. Even if those patents would be unlikely to survive re-examination, the re-examination process is long and expensive, and even the most outrageous of patents enjoys the presumption of validity. A patent pool is a consortium of at companies that agree to cross-license each other’s patents — a sort of mutual non-aggression pact. But perhaps companies that only believe in the defensive use of patents should take a more aggressive approach to patent pooling. Following the example of NATO, they could create an alliance in which they agree to mutual defense in response to an attack by any external party. I don’t know if such an approach would be viewed as anti-competitive, but it does strike me as a cost-effective alternative to the current approach for defensive patenting. Since PATO is chartered to promote the free exchange and licensing of software patents, members do not seek revenue from their software patents–only mutual security. Thus, anybody can join PATO, even individual programmers who do not have a patent to contribute to the pool–they need only pay the nominal yearly dues and adhere to the treaty–that any software patents they are granted will go in the pool and that they will not sue any other PATO member for infringement of a software patent. It’s been almost two decades, but perhaps PATO is an idea whose time has come. And, even if a collective effort fails, individual companies might do well to focus less on intellectual property capture and more on collecting the kinds of nuisance patents currently favored by trolls. After all, the best defense is the credible threat of a good offense. Even if you hate software patents, you can’t afford to ignore them if you are in the software industry. And I’m well aware that not everyone shares my view of software patents. But I hope those who do find useful advice in the above discussion. I’d love to see the software industry move beyond this innovation tax. Hey, Daniel, sounds like you think Google is hurt more by software patents than helped? And that is probably the case for other companies as well? In that case, why doesn’t Google lobby for change in patent law? Lobby Congress, try to get the patent office to change its standard for software patents, and fight court cases with the specific intent of changing precedent for enforceability of software patent cases? Google certainly has the money and visibility to push for significant change both for their own and the greater good. So, I have been surprised that Google has not been pushing harder on change that would essentially eliminate all software patents. My explanation for why was that Google believes it still gets more benefit than harm from software patents. Do you disagree? My personal experience with software patents is not positive. I don’t believe they protect startups since startups cannot reasonably pay the legal fees nor endure the length of court time necessary to enforce a patent. And, I think software patents inhibit innovation and worker mobility, reducing economic efficiency generally, because people who switch companies but keep on working on the same technology risk getting sued by their own patents from their old company when doing work at a new company. So, I personally would welcome change. Even if you hate software patents, you can’t afford to ignore them if you are in the software industry. Even if you hate software patents, you can’t afford to ignore them if you are in the software industry in the Untied States and a few other jurisdictions. Another rational option is simply leave the jurisdiction that threatens your livelihood. US citizens are by law required to not sell into a certain set of nations- Sudan, Syria, North Korea, and Iran at least. Similarly, a software developer situated in the EU cold implement the same precautions against selling into the US, South Korea, Australia, Japan and a few others and still have a market large enough to make a very good living. As I said in the first paragraph of this rant, the material in this post is US-centric, and your national software patent policy may vary. I’m pretty sure that many readers of this blog work in the software industry and are not willing to forgo doing business in the United States. But yes, it’s an option. You did say that, absolutely. I was just trying to emphasize a little out of the box thinking for people with the flexibility to exercise an entirely different option. Also note that not selling into the US because it’s fundamentally hostile to business is not a message likely to be missed by lawmakers. Your excellent review included the idea that if companies followed Google’s suit of not caving into trolls, they would eventually disappear. The problem as you noted is that not all companies would follow Google’s lead. My solution doesn’t require that every developer follow its lead, only that an unknown, but politically sensitive number of developers do so in order to effect change. You’re missing the biggest patent troll in the room, the USPTO. How much does getting a patent cost these days, $10,000, 20,000 plus? For the right to protect your intellectual property? How much does a book, music, movie copyright cost, $0? Your article has automatic copyright protection, yet any product idea that you publish is automatic public domain unless you pay the USPTO. Imagine if you had to register your articles for $10,000 a piece or anyone could put their name on it. If you want to discuss innovation taxes, look at the USPTO. Daniel, thanks for a thought-provoking article. Let me add my 2-cents… The current system is such a mess and has so many vested interests that meaningful patent reform does seem unattainable. I agree that it may be better to start over with a clean slate. Do you happen to know if these problems are unique to software patents or are other fields similarly afflicted? Pharmaceuticals seem like they might be in the same boat. In my experience, the “obvious to one skilled in the art” test seems largely forgotten in practice and the USPTO is unprepared to apply it. Is it even possible to apply a test like that in the context of the legal system? Perhaps we limit the number of software patents awarded each year and only choose the 100 most innovative through some kind of open patent competition. Let them become a kind of patent Nobel award. That would probably kill the interest in software patents by most companies and trolls. It’s in the difference between the subject matter. The IP protection afforded a copyrighted work is just that work itself. In this way, the boundaries of the IP is self-describing. This is not perfectly true, there are issues of “how much” of a copyrighted work can be used without infringing (see George Harrison’s song “My Sweet Lord” vis-a-vis a song that antedates it named “He’s So Fine”. ), but it’s approximately true. For patents, the boundaries of what is covered by the IP are defined by a back and forth between the patent office examiner and the patent seeker. It’s much more time and knowledge intensive. It’s not an impossible world to consider- just issue patents automatically and let the court system sort it out. Is that really any better or cheaper ? The problem is that software patents are patents on ideas, not exact ways of doing something. It’s as if I patented the idea of a light-emitting glass enclosure instead of a tungsten filament incandescent bulb. Software patetns are not patents on software, either source nor object code, they’re a patent on the algorithmic steps the software performs – never mind HOW it’s actually done. You can conceive of a patent system that patents the execution of software code exactly, but it would not be meaningfully different from the copyright protection that, as you point out, already exists for software anyways. This is all beside the point. The reality is, all software has IP protection sufficient to induce the writing of software and reward people for doing so. That is not a theoretical statement, it’s a description of the flourishing software eco-system that existed prior to time when patenting software became widespread. That eco-system saw the development operating systems, word processors, spreadsheets, computer graphics, the internet, etc etc etc. As anyone who’s gone past high school knows, an existence proof is the strongest possible form of proof, and that market is in fact an existence proof that patents are not necessary to secure the societal benefit that comes from software being created. A sector of our population speaks as though patents were a birthright. In fact, patents exist only to serve a societal, not individual good. That good is the promotion of the useful arts and sciences. If that criteria can be met absent patents, and it’s a indisputable and historical, empirical fact that it can be, then no patents are owed to anyone. Exactly, that would be both better and cheaper. That’s also the current state of things. USPTO just rubber stamps everything and things get sorted out in the courtroom. For example; U.S. Patent 6,025,810, U.S. Patent 6,368,227, lots more at Wikipedia. Sometimes it’s useful to make explicit what’s only implicit in the current system in order to highlight the lunacy of it. Towards that end, consider the similarities between patentable algorithms and ideas in a novel (a book) . IN what follows it’s hard to see why IP absolutists don’t go after novelists the way they have software developers. *Both end products have a schism between the series of ideas they present and the exact expression of each of those ideas. * Both end products- the software and the novel- rely on a large assemblages of small ideas- typically thousands, tens of thousands or even hundreds of thousands. A book has maybe 100k words in it and perhaps 10k sentences or complete thoughts but potentially many more patentable ideas since ideas are an abstraction above the level of sentences, just as the ideas contained and patented in software are an abstraction above the level f code used to realize them. *All expressions of ideas associated with both activities are completely novel. As linguists are fond of pointing out, each time someone speaks, it’s a completely novel utterance never before spoken. Novel and useful is indeed the criteria IP absolutist apply to determine patentability. So also with software- we may share an idea, but the way I express that idea will not be the same way as you express it. *In both cases, the ideas and the words used to express them are both produced naturally and with great fluidity by their respective authors and this is a necessary part of engaging of in the act of creation for the creator. If novelist had to stop to do a full genealogical work up of every idea they expressed, people would not write novels. But this is exactly what is required of software developers since software developers are infringing merely in the act of compiling and running a program in the privacy of their own home or workplace. *No useful work can be created without a large assemblage of such ideas and therefore a systematic accounting of ideas for the purposes of remittance would prove impossibly burdensome and have a chilling effect of creativity- to put it mildly. Such an accounting which would have to include things like “the ultimate essence of the idea independent of its expression” and “the exact scope and underlying ideas of every idea”. Unless the ultimate purpose of human activity is to provide full employment for philosophers and IP lawyers, any such system is doomed to be crushed under the regulatory burden it imposes on otherwise normal human activity. *In both cases, the ultimate origins of new ideas owe very much to everything that has come before. While all utterances are indeed novel, all ideas are somewhat derivative and owe enormously to past, similar ideas. *Clearly all such ideas are useful in and of themselves and thus worthy of patent protection. Additionally, collectively, their usefulness when put together in particular ways creates a new utility also deserving of patent protection. Obviously this list is not exhaustive, but the point is clear. There is nothing special about what is being patented under the rubric “software patents” that distinguishes it from the ideas which constitute any given literary work. That’s because software patents are patents on ideas, not software, and any software needs tens or hundreds of thousands of such useful, distinguishable ideas. Also note that, without the slightest bit of hyperbole or exaggeration we can say that many times a day, the law as it stands makes criminals of us all. It is a violation of a patent to make the patented object in the privacy of your won home, and use it, even if you have no intention of selling it or even giving it away. That means every time you unknowingly violated a patent holder’s patent in your code you’re still liable and still in violation of the law. This is not an exaggeration. What are we to think of a system that mechanically consigns us all to the criminal class? This is a system that breeds contempt for the law, at least. I can pretty well guarantee any given developer is an uncaught criminal accumulating a debt of many millions of dollars over the course of a career. This is the law. Perhaps we need look no further than Egypt to see what happens when the law becomes the private vehicle for the enrichment of a small, barely value-producing, special interest segment of society. This is exactly what we have with the injection of IP lawyers into software. Yes, I think that there are only a few companies that benefit from the software patent status quo, and that Google isn’t one of them. why doesn’t Google lobby for change in patent law? I believe Google does lobby for change in patent law, but it’s an uphill battle. That said, I think Google could take steps that might be more effective and immediate than lobbying. For example, Google could declare a “no first strike” policy and rally other companies to sign on to it. Some might criticize Google for doing this only because of its relatively weak patent portfolio, but I still think it would be a PR win — and would only reflect the reality that Google doesn’t, to my knowledge, ever initiate patent lawsuits. Google could also invest in the development of tools to improve prior art search and speed up the invalidation of dubious patents. Lots of wins here, including tackling some of the hardest problems in the search space. But yeah, I think Google could and should do more. Do you happen to know if these problems are unique to software patents or are other fields similarly afflicted? I don’t know if the problems are unique to software patents, but I think the case against software patents is much stronger than against other kinds of patents that involve many years of large, high-risk investment. In particular, I make the case in an open letter to the USPTO that software patents do not lead to either of the two outcomes intended by the patent system, which are incenting inventors to disclose (i.e., teach) trade secrets and encouraging investment in innovation. Very well said. And that’s essentially what I argued in my open letter to the USPTO in the narrow context of software patents. This article glosses over the most important item related to innovation – how do you protect the true small innovator? I don’t think anyone would argue that small or independents are the ones doing the majority of the innovating. So how do you provide the small guy with some guarantee of return on their investment into costly R&D? This shows a complete misunderstanding of the patent system. You cannot patent ideas. Take method patents – they specify a very specific set of steps that is being claimed. Actually, it’s you who misunderstand. First you misunderstand what I said. What I said was that in effect ideas are being patented. That’s true. A step by step procedure to achieve an end is the definition of an algorithm. So algorithms are being patented. A small step back on this is to be found in Bilski v. Kappos, but the court remained silent over software and allowed business methods . Each step of an algorithm is an abstract thing at some level. Sorry, but abstract things are also known as ideas. Bilski wasn’t rejected because it was abstract, it was rejected because it was “too abstract” . The only concrete form a software program takes is source and object code. Neither of these are what is being patented under software patents. What’s being patented is something more abstract, specifically, achieving the same ends through any software program whatsoever. Adobe has a patent on floating tool palette. (1) Establishing an area on the computer screen in which the multiple sets of information are to be displayed, the established area having a maximum size which is substantially less than the entire area of the screen. (2) Providing within the established area a plurality of selection indicators, one for each of the multiple sets of information. (3) Selecting one of the multiple sets of information for display within the established area by pointing to one of the selection indicators within the established area, whereby the selected set of information will be substituted within the established area for the set of information previously being displayed therein. A selected set of information may also be moved out of the selected area by pointing to its selection indicator and dragging it away. This is just ideas being enumerated by numbers. No code is presented, that is, no working machine. It wouldn’t matter HOW I achieved the same ends because HOW something is achieved is not the subject of the patent, the END of what is achieved, through any code, is the patent. That is patenting an idea, in this case the idea of a tool palette. This is the same as if I had patented the idea of a light emitting glass bulb and not been obligated to actually describe how it’s achieved. It’s a light emitting bulb consisting of a 1) a glass enclosure containing a light emitting apparatus 2) a light apparatus consisting of a wire which when electricity is applied, emits light. This is the exact same level of abstraction. It’s not impossible for Adobe to spell out exactly how their machine works- computer software is the definition of exact. So let them do that. You patented your code and it’s a non-abstract, concrete thing. Congratulations, but it’s no different than copyright, is it? But they don’t want to do this. They want to be permitted to patent at a higher level of abstraction. The level of ideas. Take method patents – they specify a very specific set of steps that is being claimed. Just because this is true doesn’t mean that this is what is done with software patents. In fact, the “very specific steps” are NOT patented even though they’re right there in source code. Thanks to the USPTO the small guy has been priced out of the right to own their intellectual property. The small guy doesn’t have the money to possibly patent every little innovation they come up with, so it is declared public domain. 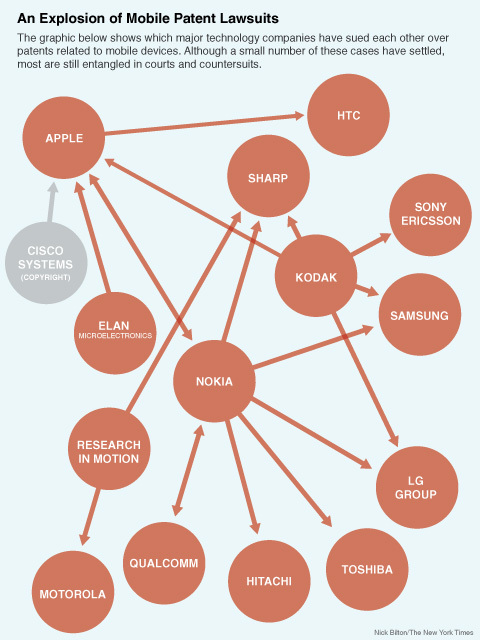 The big guys have the money to patent everything, so all their work is protected. An innovation tax thousands times greater than all the patent trolls combined. To those who are complaining that obtaining a software patent is too expensive for the small guy: that’s like complaining that the cost of obtaining nuclear weapons is too expensive. Fairness considerations aside, I am against nuclear proliferation — and I don’t see how getting more nukes into the hands of small guys makes the world a better place. You don’t need to file patents to innovate. And patents don’t prevent others from copying your innovations unless you enforce the patents through lawsuits — and small companies don’t usually sue big companies for patent infringement today because bigger ones are likely to have patents of their own with which to countersue. If you care about the small guy, then you should be against software patents and their chilling effect on entrepreneurship and innovation. Say no to the innovation tax! I’m flattered by the attention you’ve given my post, and I’ll reciprocate by responding to yours. And I’m not even sure we disagree that much on the facts of how things are, even if we differ on how we want them to be. You are right that not every NPE can bankroll a patent infringement lawsuit or find a law firm willing to take a case on contingency, but I’ve seen enough baseless suits to conclude that the entry barrier isn’t very high. Indeed, my personal experience in patent prosecution made it clear that examiners lack the subject matter expertise to do their jobs, at least when it comes to software patents. As a result, there are a lot of software patents that should not (and hopefully would not) stand up to re-examination, but enjoy the presumption of validity. The “ruinous costs” I referred to are those that a company faces if it does not successfully defend against the lawsuit, not the costs of the litigation. But that cost of losing is the leverage an NPE has to cause a defendant to rationally spend more money on its defense than the NPE spends on offense, since the stakes for the company are much higher than those for the NPE. And that’s why companies often settle with NPEs rather than fight to the finish — the company not only can’t afford to lose, but can settle at a lower cost than winning. That’s why NPEs can win settlements even with baseless patents. Sometimes I wish I had “a complete misunderstanding of the nature of NPE patent litigation” — perhaps ignorance would be bliss! Fortunately, my experience, though painful, has been highly instructive. My point exactly, why is the USPTO collecting examination, renewal, etc. fees, if all I get is a rubber stamped piece of paper that I have to defend in court anyway? As for software patents, they’re a patent like any other. If I come up with a new taskbar interface for Windows and it becomes very popular, are you saying that it’s public domain? That Microsoft can just take it? What if I come up with a Internet search algorithm that’s better than Google’s search algorithms? Google can just use it? Or a new faster file system? A new image compression algorithm? Are all these supposed to be in the public domain? For this reason, he says, companies won’t take legal action against defendants with no ability to pay- it’s too expensive, too risky that the costs won’t be recouped. But this is false and therefore your argument his fallacious. There are innumerable cases of smallish companies using their patents and lawyers against even smaller entities and individuals who are not monetizing the usage of the IP. In fact such activity is an every day occurrence, as it must be as software patents continue to explode in number because the fact of the matter is, privately held firms have no public disclosure requirements if they send a cease and desist letter, sue, license or otherwise settle, so the full scope of patent-centric legal action is unknown. This includes mere threats of lawsuits directed towards entities that can clearly not afford to mount a defense and simply go out of business. PanIP has sued small businesses in groups of ten. Systematically suing small web site owners. His characterization of what goes on with respect to the chilling effects of software patents is only one aspect of a much larger picture. The law firm is taking a calculated business risk in bringing a suit on contingency, and a patent owner typically has to convince the firm that the patent represents a good investment. Every lawyer worth his or her salt will assume that any given case will proceed through trial, and needs to secure financing to cover those costs. This cannot be true if litigants are willing to sue entities with zero ability to pay. A better characterization of the real situation is that litigants know they can pick off small companies and individuals with inexpensive threats, as do their lawyers, and they use these consciously and strategically to thwart innovation and competition within their markets. This accounting still leaves off what is likely the largest dynamic around software patents- the companies that never come to exist, the programming and innovation that never happens because individuals look over the software patent landscape and conclude, quite rationally, that while they could bring a product to market and serve customers, they could never afford either the patents or the lawsuits that would inevitably come their way. And from a larger perspective we see that this aspect of the software patent debate only focuses on the nature of legal activity around software patents. The more important, encompassing question of whether such patents contribute to the Constitutionally mandated requirement that patents must “promote the useful arts and sciences” or whether on whole they impede those same activities. No, nothing you do is automatically public domain. Everything you write has copyright automatically attached to it. No one can steal your code and use it without your permission. Every part of your new faster image compression depends on and uses scabs of code that in its day was innovative but not patented. No one can just steal your hard work, but neither can anyone be permitted to monopolize fundamental algorithms. It’s not about the individual, it’s about all individuals and the needs to maintain technological progress and not impede it. But your work is 100% yours . For all we can argue about the good and evils about protecting IP via software patents, most of the evils boil down to one simple fact to me: there is no IP in 99.9% of software patents. The ideas presented in the majority (but not all) software patent I’ve ever looked at have no originality in them at all, the only thing new about them is the patent itself. What we need is to change the process by which patents are granted. A peer review (and lawyer free) process comes to mind: if a sufficient body of software developers agree that an individual or company has truly created something the world has never seen before then I support their right to some legal protection of that idea. (That said, I think as you suggested, shorter term lengths may be in order based on the pace the industry moves, even for truly novel software inventions). We might even be able to cut the cost of the patent application process this way by immediately throwing out the majority of applications and taking advantage of those who would gladly donate their time for nothing in order to clean up the mess the USPTO has created. A little justice for everybody instead a lot of “justice” for the rich? One more thought: hoping that change might come through appealing to the good nature of the folks at the USPTO seems absurd to me, things didn’t get this bad by accident. Patent review is not going to cut it, we need USPTO review. Thanks for your thoughtful commentary on this topic (both here and at gametimeip.com). I apologize if my post suggested that your opinions were completely unfounded. To the contrary, your perspective on this topic is incredibly helpful. I hope we can keep the conversation going. I worked for a BigCo and filed many patents. It was a mixed bag. The time horizon is so long that even after I’ve been gone for 3.5 years many of them are still lost in the USPTO. Average time for me to see granted patents was 5+ years. 1) Patents really matter for BigCos operating on a long time horizon. It’s a strategic investment. 2) Patents are nearly worthless for a Startup or SmallCo. The time horizon is way past your foreseeable future, and thus the whole effort is akin to planning for an alternate reality different than the current business context. Throwing coins in a fountain for good luck is about as relevant. You simply are better off getting a filing date on a provisional design writeup and hiring an engineer with the money you’d spend on Patent lawyers. 3) As an Acquiring company looking at a company to acquire, Provisional or Pending Patents are a liability not an asset. They take time and resources to push to completion for a strategy of deterrence. 4) Patents are mostly ignored in the professional literature. Take Sentiment Analysis as one example. Sentiment Analysis exploded in 2001 w.r.t. Academic publishing, yet there are more than a few older patents discussing good technical work on Sentiment Analysis. I’ve NEVER seen an algorithm in a patent cited in a paper as previous work. And I have seen academic papers with algorithms already 90% covered by an older patent… and the papers are cited as ‘novel work’. 5) Finding relevant patents is ludicrously hard. It might be the most challenging problem in IR w.r.t. a corpus IMO. Different words mean the same thing and vise versa due to the pseudo-ability in a Patent to redefine a word away from the obvious meaning. With two different lawyers rendering the same technical design into a writeup and claims results in wildly different work product. 6) I’ve seen some doosey granted Patents. Things that appear to either be implementations of very old CS ideas into new domains.. or worse stuff that would be a class project as an undergrad. It’s just plain ugly in this realm. Our marching orders at Lucent Bell Labs were to create an “intellectual property minefield”. The patent lawyers described the speech recognition industry as a battlefield. They said several areas of the battlefield are already covered by patents. They then said they wanted us to find the holes where there were no patents, and lay down patents, thus forming an IP minefield which would blow up on anyone attempting to step into speech recognition. I got one patent while I was there, and it was actually for something relatively novel. On the other hand, people were getting patents for things like attaching databases to speech recognizers. Just plain silly. As a small company, we spend a few percent of our revenue dealing with things like indemnification clauses in contracts. Many companies live in fear of being sued. More than one “biz savvy” potential investor told us we’d have to close source all our software because leaving it open source makes it too vulnerable to patent trolls. Some told us we’d need to beef up our IP portfolio (meaning patents). We wound up not going for VC because we didn’t want to get on the roller coaster. I can’t see a plus side to the way patents currently work.